The State Russian Museum is keeping the world’s largest collection of Russian fine art. It was established in 1895 and opened in 1898 by the decree of the Tsar Nicholas II. From its early days, the collection was placed in the Mikhailovsky Palace, which was built for Mikhail Pavlovich – the son of the Tsar Pavel I. The Museum collection consists of paintings, sculptures, graphics, decorative and applied arts. Today, it is a unique depository of artistic treasures, a leading restoration center, an authoritative institute of academic research, a major educational center and the nucleus of a network of national museums of art. The Museum collection contains nearly 400.000 exhibits. 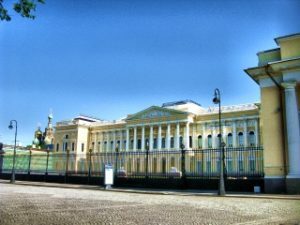 The main complex of museum buildings – the Mikhailovsky Palace and Benois Wing – houses the permanent exhibition of the Russian Museum, tracing the entire history of Russian art from the 10th to the 20th centuries. The museum collection represents all forms, genres, schools and movements of russian art. This excursion is not available on Tuesdays (museum day-off).